Why you need to take an annual hearing test. Hearing loss facts you need to know. Legally noise is exposure to sounds exceeding an average of 90 dB of noise for eight hours per day. A TWA (time weighted average) of 90 dB equals the current maximum legal noise exposure. The exposure level is currently being reviewed and NIOSH is recommending that the TWA be reduced to 85 dB for all workers. How can you prevent this from happening to you or your employees? Noise control measures should come first. Eliminate or reduce the noise whenever possible. When all measures have been taken to improve the environment, hearing protection is required if noise still exceeds the action level. An average hearing protector attenuation is 20 to 29 dB. Considering that every 3 dB cuts the noise in half, you can get a lot of protection from an ear muff or ear plug. But hearing protection has to be used correctly or they will lose a great proportion of their effectiveness. Symptoms of hearing loss helps you understand the impact of not getting tested. How can you tell if you or someone near you has a hearing loss? Turning up the television or radio is a very common sign of a hearing loss. The appropriate volume may seem too loud to others. Focusing on one speaker in a crowded or noisy environment is often especially difficult for a person with a hearing loss. In a car, the engine, road or wind noise can make it hard to hear a conversation, the radio or important traffic sounds. People with a hearing loss frequently feel that others mumble or need to repeat what theyve said. Often, a person will hear, but not understand, whats being said. Social occasions are often difficult for a person with hearing loss. Background noise, such as music or group conversations, can become overwhelming, making it impossible to participate in a conversation. Its easy to forget how much we rely on our hearing every day. Sirens, automobile horns, and other people are only a few of the things that we need to be able to hear clearly. In church, theaters, and auditoriums, it can be very difficult to hear a speakers voice. Many facilities have assistive listening devices available for those with hearing loss. To put the chart on the right into perspective, according to OSHA's regulation of industrial noise exposure, an average worker surrounded by levels around 85-90dB for an eight hour day will not exceed the limits of exposure time within a 24 hour period of time. However, when the sound levels exceed 100dB, your exposure time is reduced to two hours. When sound levels exceed 115dB, your exposure time is drastically reduced to 15 minutes. This puts riding a motorcycle or playing a loud guitar in a whole other realm as 103dB is comparable to a running chainsaw or contrete jackhammer. Cupping your hand behind your ear can help a little, but its no substitute for a properly fitted hearing aid. And remember - a hearing loss is more noticeable than a hearing aid! Protect your hearing by getting annual hearing tests. Although there are several versions of hearing protection devices on the market, a custom set of earmolds is still the best answer in suppressing sound. They provide excellent attenuation values and are comfortable to wear for extended periods of time. They can even be molded with high-grade transducers, which allow for stereo compatibility or communications. To find out more about these products search under our "Hearing Protective Links" listed on the navigation bar. Anvil - one of three bones of the middle ear that help transmit sound waves from the outer ear to the cochlea. Also called the Incus. Assistive Device - any device other than a hearing aid which helps the hearing impaired. Audiogram - a graph depicting the ability to hear sounds at different frequencies. Audiologist - a person trained in the science of hearing and hearing impairments, who can administer tests and help in the rehabilitation of hearing-impaired people. Audiometry - the measurement of hearing acuity. Auditory Nerve - the nerve carrying electrical signals from the inner ear to the base of the brain. Cochlea - shaped like a snail's shell, this organ of the inner ear contains the organ of Corti, from which eighth nerve fibers send hearing signals to the brain. Cochlear Implant - replacement of part or all of the function of the inner ear. Conductive Hearing Loss - hearing loss caused by a problem of the outer or middle ear, resulting in the inability of sound to be conducted to the inner ear. Congenital Hearing Loss - hearing loss that is present from birth which may or may not be hereditary. Cycles (per second) - measurement of frequency, or a sound's pitch. Decibel - measurement of the volume or loudness of a sound. Ear Canal - the short tube which conducts sound from the outer ear to the eardrum. 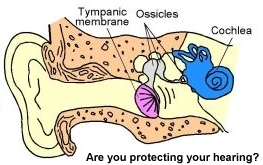 Eardrum - membrane separating outer ear from middle ear: the tympanum. Eustachian Tube - tube running from the nasal cavity to the middle ear. Helps maintain sinus and middle ear pressure, protecting the ear drum. Frequency - the number of vibrations per second of a sound. Hammer - one of three bones of the middle ear that help transmit sound waves from the outer ear to the cochlea. Also called the Malleus. Impedance Audiometry - test for measuring the ability to hear sound waves transmitted through bone. Inner Ear - the portion of the ear, beginning at the oval window, which transmits sound signals to the brain and helps maintain balance. Consists of the cochlea and vestibular apparatus. Malleus - one of three bones of the middle ear that help transmit sound waves from the outer ear to the cochlea. Also called the Hammer. Mastoid - the bone in which the entire ear mechanism is housed. Part of the larger temporal bone. Meniere's Disease - a condition resulting from fluid buildup in the inner ear, leading to episodes of hearing loss, tinnitus and vertigo. Middle Ear - the portion of the ear between the eardrum and the oval window which transmits sound to the inner ear. Consists of the hammer, anvil and stirrup. Nerve Loss Deafness - a term used to differentiate inner-ear problems from those of the middle ear. Organ of Corti - the organ, located in the cochlea, which contains the hair cells that actually transmit sound waves from the ear through the auditory nerve to the brain. Ossicles - collective name for the three bones of the middle ear: hammer, anvil and stirrup.